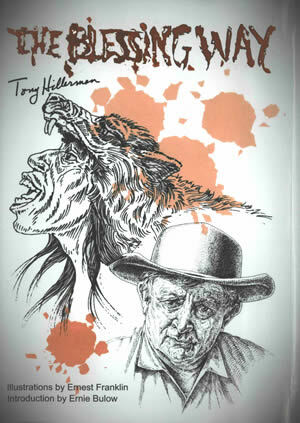 This is a 2006 illustrated hardcover edition of Tony Hillerman's first novel, The Blessing Way with illustrations are by Ernest Franklin and an introduction by Ernie Bulow. It was published in 2006 by Sidewinder Publishing in Albuquerque, New Mexico. This is a hardcover book with a dust jacket and a slipcase. Binding: Fully bound, black cloth, charcoal endpapers. The author, title, and publisher logo are printed in gold on the spine.